Cognex Corporation (NASDAQ: CGNX), the world's leader in machine vision, today announced the introduction of the In-Sight® 2000 series, a product line that combines the power of its industry-leading In-Sight vision systems with the simplicity and affordability of a vision sensor. Ideal for solving simple error-proofing applications, these vision sensors set new standards for value, ease of use and flexibility thanks to the powerful combination of proven In-Sight vision tools, a simple setup, and a modular design with interchangeable lighting and optics. "For over 15 years, manufacturers around the world have relied on In-Sight to improve product quality, increase throughput and reduce waste. Now they want a cost-effective way to expand the use of vision technology down to the simplest applications?mdash;using the same setup software they use to solve more challenging vision tasks," says Joerg Kuechen, Vice President and Business Manager for Vision Products. "The In-Sight 2000 series can easily be applied to simple vision applications right out of the box, while delivering the reliable performance expected from In-Sight vision systems." The In-Sight 2000 series includes an integrated, high-performance image formation system consisting of field interchangeable lenses and a patent-pending LED ring light that produces even, diffuse illumination across the entire image, eliminating the need for costly external lighting. Customers can easily swap out the lens and change the color of the integrated ring light as needed for their application. Together with the In-Sight Explorer™ EasyBuilder® interface, which provides a fast, step-by-step application setup, the In-Sight 2000 series allows even novice users to achieve extremely reliable inspection performance in nearly any production environment. Cognex will premier the In-Sight 2000 on Tuesday, November 24th at the Nuremberg Exhibition Centre during the annual SPS IPC Drives conference. 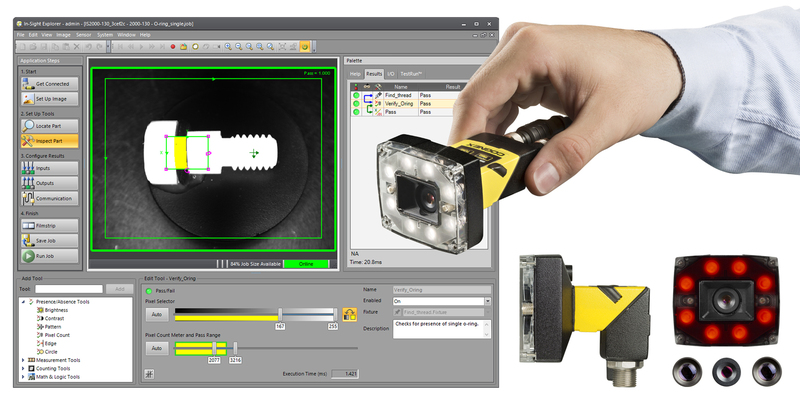 See live demonstrations November 24-25 at the Cognex booth (Hall 7A, Booth 512). The In-Sight 2000 will be available for next day delivery starting on January. 25, 2016. For more information, visit www.cognex.com/2000.